In the early 1970s, as an enthusiastic art student, I did a large painting of my mother and her friends at Camp Raquette Lake, a haven for well brought up Jewish girls in upstate New York. The setting was the early 1940 ’s, the atmosphere was camp in both senses of the word, and the source material was a dog-eared photograph I had found in a family album. What interested me principally was the biographical content (30 years later my mother could identify every single person though she had not set eyes on them since) and the painting has Larry Rivers-type stencilled names above each well–coiffed head. Using photographs as source material was prevalent at the time - indeed some august practitioners are present in this show (Richter, Pistoletto, Morley, Artschwager, Warhol and Hockney). But as a young figurative painter I was very confused about the ethics of using photography as a tool in painting. It seemed a cheat. It seemed that it solved too many problems. It presented a ready-made subject. It was someone else’s aesthetic decision. It had vagueness in all the wrong places. I was never comfortable with it and had vague feelings of guilt. This show at the Hayward addresses all these concerns. Its title - taken from the writings of that seminal modernist Charles Baudelaire - is a coherent and intelligent exposition of all these painterly concerns. Curated by Ralph Rugoff, new-ish director of the Hayward, the show does not attempt to present a single analysis. Ranging from the intensely political to the intensely personal, it posits only that, according to Rugoff, “no image is innocent”. Photographs implicate us, he says. Whether we appropriate them for ourselves from the press, raid the family archive, take pictures on our summer holidays, or use our phone at a gig, we are all implicated to this invention of the 1830s, which once led to the declaration that easel painting was dead. Thankfully for painters, this death knell has proved to be hubristic and premature and this show demonstrates convincingly that photography as source material forces the artist to confront a visual image in a myriad of ways. However, it seems to me that a constant theme for all of the disparate contributors is an interest in the way photographs tell lies. Issues of depth of field, focus and light affect the way an image is perceived, often beyond recognition. Ambiguity is paramount. Vagueness is a rich seam. In an embarrassment of riches (proverbially there really is something for everybody) it seems arbitrary to single out individual artists, but the endlessly self–reinventing Gerhard Richter stands out and we enter the show with his paintings. Richter, in the Introductory section shows the first of many paintings; Frau mit Schirm (woman with umbrella). Painted in 1964, it departs from a newspaper image of what at first seems like an everyday portrait of a German hausfrau. This thin anonymous woman clutches an umbrella, right hand to mouth - perhaps to suppress a yawn or smile? Then we see that it is Jackie and we are in the tragic hours after her husband’s murder. In the section called “Work” a hallucinatory painting by Marlene Dumas, The Visitor from 1995 displays a group of women, backs to us, evidently awaiting a palpably important presence. We, the viewer are in the same boat. Is it their leader, their saviour? Who might this visitor be? No, it’s not who we think it might be. It’s a “john” and this is a brothel and we are waiting for him too. Vija Celmins in Freeway of 1966, uses a photograph taken from the steering wheel of her car on a daily commute as a template, but the painting seems to go way beyond the edges of a photograph. Time, space and sound inhabit this monochromatic work. Celmin’s paintings are always strange and interesting and are not seen enough in England. There are several in the show and they are eloquent, quiet and transcendent. They seem to contain time. Painting from photography can, as Rugoff says “slow down the way we look at images” and this is so welcome. 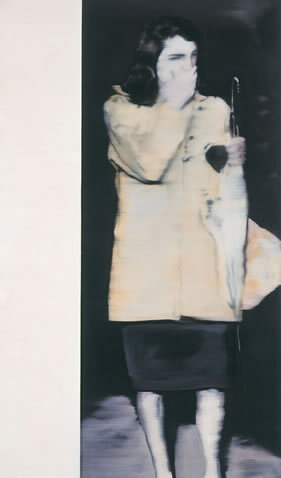 Judith Eisler in Smoker (Cruel Story of Youth) of 2003, uses images taken off the TV screen and blown up to seem like abstraction. Martin Kippenberger adopts his position of “medium”, using proxy professional sign painters to paint out his instructions. 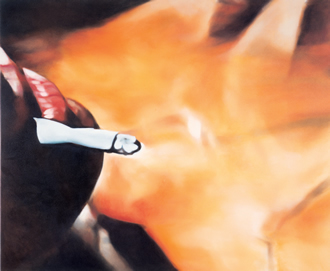 Richard Hamilton paints images communicated to him over the telephone. 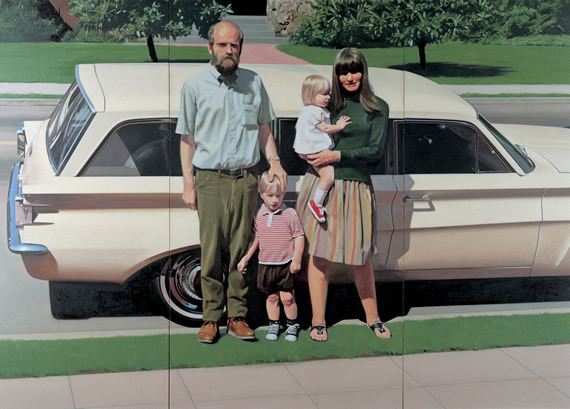 Robert Bechtle’s platitudinous images of bucolic Californian suburbia are little ironies wrapped up in layers of photorealist scrutiny. This is a BIG SHOW. The Hayward looks very good. The work is ambitious, involving, and provocative. The Painting of Modern Life is at the Hayward until 30 December 2007.